After the ruthless and atomic elimination of one time most vibrant student union in central Africa, University of Buea Student Union, UBSU, the minister of higher education recently signed a decision suspending leaders of an association dedicated to defending the rights of Cameroonian students from the University of Yaoundé One. 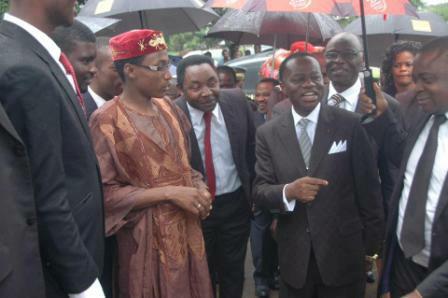 Thierry Batoum, president of Addec and Barthélemy Tchaleu, S.G were even detained for days before release. They were suspended for alleged attempt to incite disorder in the university due to tracts distributed, seen by authorities as calling the students to take part in strike action. These tracts were simply denouncing the fact that the Rector of the university purportedly asked students to pay the sum of 5000fcfa as insurance and 1000fcfa as identity card fee. Whether true or not, the manner in which these students were intimidated leaves one to now understand why every move by any student union in Cameroon is always seen as bad, and received with bad faith. If Yaoundé One university authorities had nothing to hide, it was their place to clarify students on the issue. One is more interesting is the fact that after this suspension, a certain group of students wrote a joint letter to denounce the activities of Addec. Whether they were force to do so or not, your guess is as right as mine. 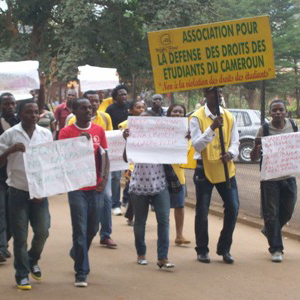 These same students were imprisoned by police in Buea, when they went to University of Buea to enquire the raison d’être of imprisoned UB students during the 2013 February and May strike on Campus. There is no fact denying that some activities of these student unions like destroying government properties, intimidation among others left authorities with no option than to use repressive measures. But it was also time for some to eliminate unions and create caricature ones and installed puppets as leaders. Yes, Cameroonian student unions have fallen, and campuses are suffering from lack of toilet facilities, STM-sexual transmitted marks, poor food quality, intimidation, epileptic academic years characterized by lecturer strike, and at the end, they leave with degrees that have nothing to ride home about. It is high time the ministry of higher education looks into the problem of student unions in Cameroon and endeavor to bring them on board in the daily activities of various campuses. I can imagine how students are being treated with no voice to stand for their rights. Do State Universities Students’ Union Need to Exist?